View a new video on the Cuban Five, produced by the largest union in Great Britain, UNITE the Union. The film calls for the granting of visas to two of the wives. In ten years of their husbands’ imprisonment, they have never been allowed to visit. Top leaders of UNITE the Union and the United Steelworkers of America (USWA) recently were part of a delegation to the U.S. Embassy in London requesting that visas be granted. 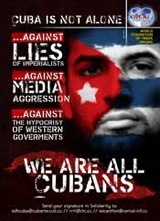 500 others picketed outside the embassy in order to call attention to the case of the Cuban Five. UNITE the Union and the United Steelworkers have recently merged.